Find the versatility of your stamps by using just a portion of the image. Cut a strip of from a Mocha Notecard and sew it to a Kraft Notecard. Cut a piece of printed paper and affix it in place above the strip. Stamp the “just for you” message with dark brown ink below the strip. Color a chipboard tag with gold tone ink. Tie with string and affix to the card. 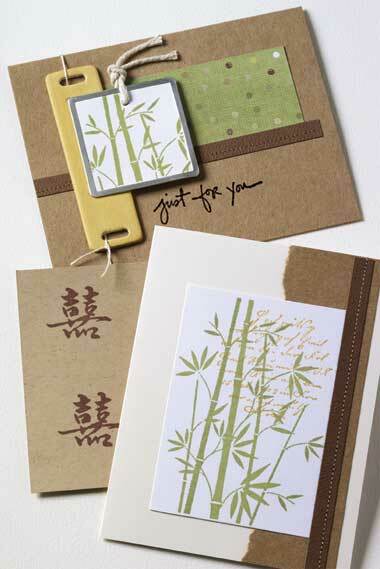 Stamp the Decorative Bamboo image with olive ink onto a square tag and wipe any excess ink off the metal. Add a string to the tag and mount onto the card. Tear a piece from a Kraft Notecard and affix to a Cream Notecard. Stamp the Decorative Bamboo image with olive ink onto a white panel. Stamp the Circle Script image with gold tone ink over the bamboo image. Adhere the panel to the card. Cut a thin strip from a Mocha Notecard and sew to the card. Use the Double Happiness stamp on the outside of the envelope and on the inside of the cards to the right of your handwritten message. When you stamp on metal rim tags with chalk inks, clean the ink from the metal with a paper towel.